This has been an extraordinarily good apple year. We have some apple trees in our garden, one of which made a huge harvest. Alone this tree grows more apples than we are both able to eat as fruit and in cakes. I like apple juice very much, but good quality apple juice costs a fortune in Finland. When I checked last in Tampere the organic apple juice was at about 3 € / litre. Therefore we started looking for local apple juice makers in order to make juice out of our apples. We did get a few kilos of other sorts of apples from my sister and a few friends of Lumias mother too, in order to create a balanced apple juice. After a good amount of searching we found one in Akaa. The local sports club there was running an apple press and a pasteur unit. Lumia made an appointment and on a nice wednesday evening we drove to Akaa with our apples. We calculated that from 50 kg of apples we should get about 35 litres of apple juice. The rule of thumb is the amount of apples in kg multiplied by 0.5 to 0.7. The multiplicator depends on the type of apples, basically the water to solid ratio, and the size of the apples. From that we calculated that we would need about 50 0,7 litre bottles. To get the bottles was an entire task by its own. When we decided to juice our apples we didn't have any clue about where we should get that many bottles from. One big portion of bottles came from Lumias mother. As a sacristan she has access to the used wine bottles (we have to remember that Lutherans get wine during mass) from the church. Another portion came from different people which answered Lumias request for second-hand bottles in a Facebook group. When we arrived at the juice makers we first had to weigh all our apples including the crates they were in. There was only another person in the queue ahead of us. We waited for some minutes and once it was our turn we dumped our apples onto the conveyer belt. From that the apples went over a shredder and right onto the press. 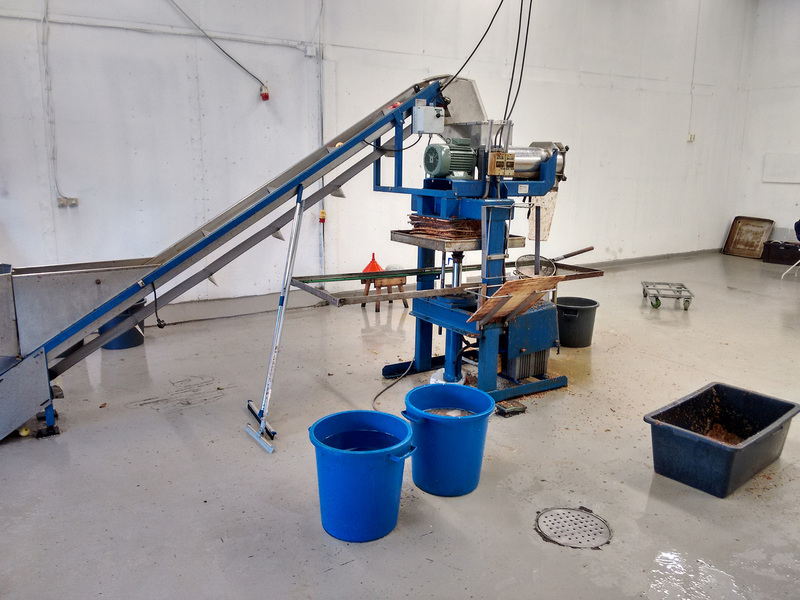 Once the block was full of our apples the operator started the pressing process. Those fruits were full of juice! After that we had to pour the juice into a storage container on top of the heating chamber. Apple juice is filled hot, above 70°C, in order to destroy any micro organisms and thus givin the juice a long time before its best before date comes about. The filling process isn't that spectecular: open valve, close valve, open valve, close valve, and so on. Once we had all juice bottled we had to pay the operator. They charged us 0,6 € / kg, which resulted in 30,- €. Transportation costs were about 7 €, that's another 0,14 € / kg. The total is 0,74 € / liter. Which is quite a difference compared to the 3 € you have to pay for a product in the store. Not included in this calculation are the red rubber closures which we bought new this year, as they will be reused year after year from now on. We now only have to check for how long the apple juice is biologically stable. I think it will be about half a year before we will find any fungi. We'll let you know if there is any juice left at that point or if we have already drank it all!